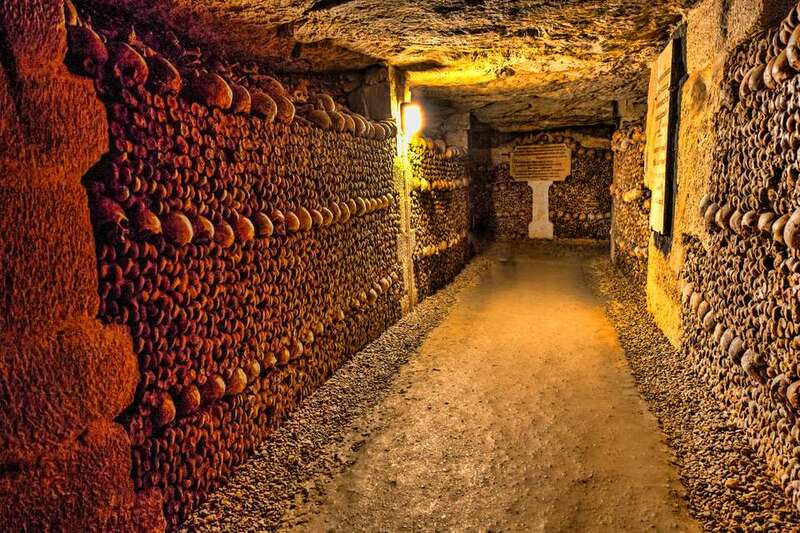 The Paris Catacombs: Creepy, Interesting, or Both? Created at the end of the 18th century, the Paris Catacombs hold the remains of some six million Parisians, whose bones were transferred from cemeteries judged unhygienic and overcrowded between the late eighteenth and mid-nineteenth centuries. The part that's open to visitors- and it's a tiny stretch of the city's vast catacombs complex-- consists in some two kilometers/1.2 miles of long, narrow corridors dug from limestone quarries deep underground. The catacombs offer visitors a fascinating-- if decidedly morbid-- spectacle of millions of human bones and skulls, assembled in elaborate, symmetrical piles. Seeming to underline just how highly French culture values artistic expression, the ossuaries are far from utilitarian: some of the chambers are decorated with wall sculptures, and philosophical poems about life and death are on display for you to ponder as you wander through the galleries. Whether you're drawn here for the archaeological and historical interest of the site or for a creepy excursion underground, the catacombs are certainly worth a visit. Be forewarned, though, that it's not an ideal excursion for young children or disabled visitors: you're required to descend a spiral staircase with 130 stairs and then climb 83 stairs on the way back to the exit, and younger children may find the ossuaries disturbing. The visit averages around 45 minutes. The Catacombs are located in Paris' 14th arrondissement (district), near the historic Montparnasse neighborhood where artists and writers such as Henry Miller and Tamara de Lempicka thrived in the 1920s and 1930s. The Catacombs recently started offering early evening visits, which should please those among you who think it's an attraction befitting the night. They're now open every day excepting Monday, from 10:00 am to 8:00 pm. The admission cutoff point is at 7:00 pm. Visits are limited to 200 people at a time due to considerable space constraints; it is therefore advised to arrive well before 7:00 pm to avoid being turned away. Tickets: Tickets for individuals can be purchased without reservations at the green ticket booth just outside the entrance to the catacombs (cash, Visa, Mastercard is accepted.) For group reservations (minimum of ten people and maximum of 20), reserve ahead by calling the Cultural Services office at the Carnavalet Museum: +33 (0)1 44 59 58 31. Group visits are offered Monday through Friday morning only. Visits of the catacombs are not recommended for individuals suffering from cardiac, respiratory, or anxiety disorders. As aforementioned, the catacombs lack elevators, making them less than accessible to physically disabled visitors. The tunnels are generally quite chilly: bring your coats in the fall and winter. In the late eighteenth century, a cemetery close to the market area known as "Les Halles" and the Saint-Eustache church was deemed unhygienic and a danger to public health by city authorities. Exhumation of bones in the "Innocents" Cemetery, which had been in use for ten centuries and was very overcrowded by then, began in 1786 and continued through 1788. The quarries that now house the catacombs were carved and the exhumed bones were transferred there following nocturnal religious ceremonies presided over by priests. After a blessing, the bones were transferred to the quarries in tipcarts covered in black veils. After undergoing intensive renovations for several months, the Catacombs re-opened to the public in 2005. Descending down the long spiral staircase and emerging into the labyrinthian corridors of the Catacombs, you emerge feeling a bit dizzy from the spiraling motion. The first thing you'll notice are the very low ceilings-- if you're claustrophobic you might want to brace yourself-- and for the first three or four minutes you'll be traipsing through empty corridors with no bones in sight. Once you do reach the ossuaries, be prepared to feel a bit incredulous at the monumental heaps of bones, arranged on each side in amusingly artistic fashion, and accompanied by poems musing on mortality (in French). You may find it creepy or just intriguing, but it's unlikely to leave you indifferent. The recently re-opened "Port Mahon" gallery contains several sculptures from a quarryman who decided to carve a model of the Port-Mahon fortress in Menorca, where he had been held prisoner by the English army while fighting a war for Louis XV. It's yet another curiosity in this most unusual of underground realms. What About the "Other", "Unofficial" Catacombs? Can I Visit Those? In a word: It's illegal and highly unrecommended. There are, admittedly, ways to get into the "unofficial" catacombs--essays like this one offer fascinating visual details of a subterranean Paris that's attracted a fair number of wannabe vampires, artists, and young people (also known as "cataphiles". But trying to get to these is dangerous on all counts.